Los Angeles, Calif. - September 01, 2009 - LOCiMOBILE®, Inc., a wholly owned subsidiary of GTX Corp (OTCBB: GTXO), has launched its new iLOCi2™ iPhone App International Version 1.2 -- initially in French and Spanish -- to easily locate and connect with others at the push of a button with total privacy. An upgrade to the previous version, which launched in mid July and featured on the Good Morning America Show, version 1.2 also provides better GPS accuracy, a GPS signal strength indicator, easily adds iLOCi2 contacts directly from your contact list and from another user's LOCi request. 60 international App Stores -- with year to date sales of 11.3M iPhones -- support the iLOCi2 App in a diverse multicultural marketplace. In just eight months LOCiMOBILE® has leaped from a white-board concept to a global transactional franchise. 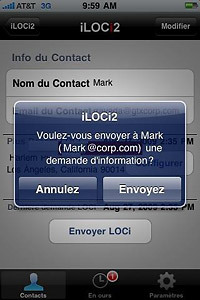 iLOCi2 has been localized for the French market where Apple has sold one million iPhones and in Spanish as well, however daily downloads for the Apps are now coming from the US and a growing International list including: Australia, Belgium, Canada, Croatia, Denmark, France, Germany, Hungary, Greece, Spain, Indonesia, the Netherlands, Sweden, Switzerland, South Africa and the U.K. A total of 34 countries to date have participated in this quintessential international e-commerce with one to three new countries coming online and downloading daily. 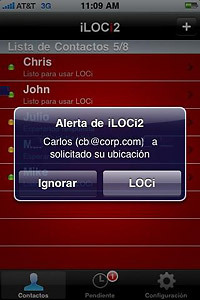 Discussions to further expand the LOCiMOBILE footprint are underway to localize the iLOCi2 App for China. China Unicom will be selling iPhones in Q4 to its current 133M subscribers, a portion of the 650M total mobile phone subscriber base of China. A reported 1.5M unlocked iPhones are already currently in use and the company is monitoring this new potential market very closely. "Since Apple launched and introduced the iTunes stores the mobile industry has rushed to embrace the sale of applications. iSuppli estimates that in Q1 2010, Apple's share of revenue from the sale of applications developed for the iPhone is expected to be $200 million, but that the greater part of the revenue -- 70% -- will go to the developers. As an application developer, LOCiMOBILE® represents the premium App based services like off-board navigation and PLS which are in great demand." The App Store will carry more than 100K apps by the end of the year, an inventory selection greater than the world's largest retailer, Wal-Mart, which merchandises about 100K items per store. Smartphone downloads from all App Stores will reach 6.67 billion per year in 2014, according to a new forecast issued by market research firm Frost & Sullivan. But that is not the whole story. The true impact will be realized as we penetrate and begin conducting real time transactions globally with an installed iPhone/iPod user base of 37 million... and growing. GTX Corp has a 7 year history in customizable, patented 2-way GPS Personal Location Services (PLS) solutions and approached the development of iLOCi2 from the perspective of ease of use, privacy and how to best deliver a people-finding solution to millions across the world at an affordable price. The answer was, "We can make an App for that." "Personal Location Awareness provides connectedness which knows no borders technically or geographically," said Patrick Bertagna , CEO of GTX Corp. "LOCiMOBILE® is a brand in motion and we are actively researching and developing for the future. With 3 Apps on the market now and our fourth in the submission process, we are very excited about what the future holds for us in this new global market place we call the App Frontier." GTX Corp (OTCBB: GTXO) develops and integrates 2-way GPS people finding technologies which seamlessly integrate with consumer products and enterprise applications. Utilizing the latest in miniaturized tracking and cellular location technology, the company offers a GPS location platform that enables subscribers to track in real time the whereabouts of people, pets, or high valued assets through its customizable transceiver module, wireless connectivity gateway, middleware, and viewing portal. Committed to being the "better people finder" technology provider, GTX Corp owns and operates LOCiMOBILE, Inc. which develops applications that transforms smart phones into real time 2-way GPS personal location transceiver, letting friends, co-workers and loved ones locate and connect with one another. The company also owns and operates Code Amber News Service, which is dedicated to the recovery of missing persons and is the leading US and Canadian syndicator of online Amber Alerts. Founded in 2002 and based in Los Angeles, California, the company has evolved from its early beginnings of putting a micro GPS device in a shoe - the patented smart-shoe -- and continues to pave the way with innovative geo-specific and proximity alerting applications that let you know where someone or something is at the touch of a button. The company believes in a strong intellectual property strategy and to date has an extensive portfolio of patents, patents pending, registered trademarks, copyrights, and URLs.